In my opinion, Jason Starr is one of the best current day noir writers. His books are usually focused on the “every day man” who gets caught up in a chain of events that spiral out of control and leaves them worse for the wear. His past two books have been outside of the crime genre, so I was very excited when I heard this book was his return to crime fiction. 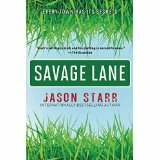 Savage Lane starts out more like a family drama than a crime novel. Starr lays out the relationships and dynamics between a husband and a wife. The wife believes the husband is having an affair with the divorcee from up the block. The husband does in fact have a desire to have an affair with the neighbor. A twist to this dynamic is the wife is having an affair of her own…with an 18 year old high school drop out that works at the local country club. While fairly entertaining, this beginning seemed a bit of a letdown for the crime novel I thought I was sinking my teeth into. But then the big crime happens and the plot kicks into high gear. Starr does a wonderful job getting inside the head of each character and lets the reader truly understand their motivations and rationalizations for their actions. Not only are his main characters real and multidimensional, he does a great job on fleshing out the secondary characters in this multi-layered work of art. While this novel isn’t what I consider noir, I think it is a great novel. It is more than a crime novel and more than a family drama. It is a great look into a marriage that is crumbling due to secrets, secret desires, and Starr pulls back the layers of some strange relationships and gives the reader a peek at the warped and crazy lives of the residents of Savage Lane. Starr proves that he can write in any genre and produce a page-turner. With the news that he and Ken Bruen have a 4th book in their series coming due soon, I am anticipating a lot of good publicity and reviews coming Starrs way.